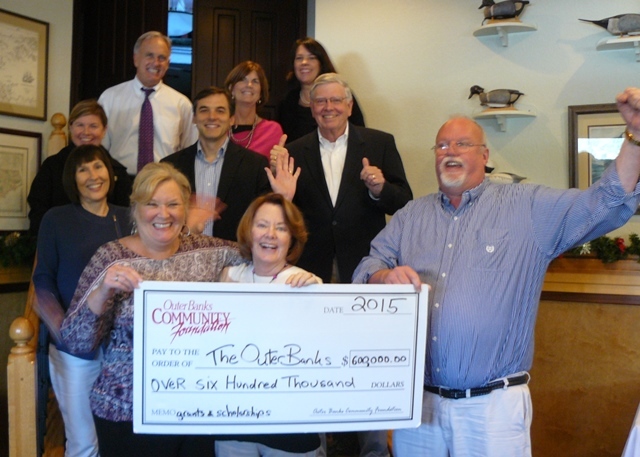 Ending another record-breaking year, the Outer Banks Community Foundation announced over $600,000 in grants and scholarships in 2015, including $60,000 in new grants earlier this month. This brings the Community Foundation’s total giving to $7 million since its founding in 1982. On December 3, the Community Foundation used its home-grown endowment to award $60,000 in grants to dozens of nonprofits, benefiting every type of charitable cause, from education and the environment, to helping the homeless, the hungry, the sick, and the elderly. This included six Community Enrichment Grants, which were awarded on a competitive basis to nonprofits that applied for funds. One noteworthy grant was to the Community Care Clinic of Dare County, which received $2,500 for its Free Clinic for Hatteras Island. The clinic is offered weekly in Frisco to the uninsured and financially challenged. Funds for the grant were provided from the foundation’s Community Fund and Advice 5K Turkey Trot Fund. The Advice 5K Turkey Trot Fund supports health and wellness projects, and is built each year from the proceeds of the eponymous Thanksgiving road race in Duck. The Outer Banks SPCA also received a grant this month: $7,000 for its Shelter Improvement Project to replace small animal cages and to install panels between kennels to reduce animal stress. Funds for this grant were provided by the Community Fund, and from the Shirley & David Doran Fund, which was established by the Dorans through a Legacy gift. In the arts category, the Dare County Arts Council won a $7,500 grant to bring free arts classes to local veterans, children and adults with intellectual or developmental disabilities, seniors with memory loss, and domestic violence survivors. Funding was provided by the Charles & Dorothy Luedemann Arts Fund, which was donated by Mrs. Luedemann by bequest in 1996. Monarch’s Lighthouse Club also received a grant this month for a Health and Wellness Program, with funding provided by bequest from the late Pauline Wright of Southern Shores and Currituck. The Frisco Native American Museum also received a grant this month: $10,000 for a new Native American Village and Longhouse, to be built by volunteers on the nature trail behind the Museum. This grant was thanks to the Milton A. Jewell Grant Fund, which was donated by Ruth Medgyes of Southern Shores in 2003. In addition, 13 of the Community Foundation’s donor-advised funds awarded grants this month, totaling almost $23,000. Donor-advised funds are funds managed on behalf of donors and families who recommend the grants that are awarded. This month, grant-making donor-advised funds were the Bingham Family Fund, Birindelli Family Fund, Burwell A. Evans Charitable Fund, Cathi Ostrander Family Fund, Friends of Manteo High School Fund, Hester Family Legacy Fund, Kelly Family Fund, Peregrine and Kaye White Fund, Preston Family Fund, Simpson-Sharp-Oakes Fund, Spencer Family Fund, Webster Family Fund, and William & JoAnn Small Family Fund. Grant recipients included the American Legion, Beach Food Pantry, Chicamacomico Life-Saving Station, Dare Education Foundation, Elizabethan Gardens, First Flight Society, Food for Thought, GEM Adult Day Services, Interfaith Community Outreach, Monday Night Alive, Mount Olivet United Methodist Church, Roanoke Island Volunteer Fire Department, Room in the Inn, and Special Olympics of Dare County, among many others. But while the grant-making in 2015 was impressive, Ms. Costa said there is urgency to do more. “The generosity of this community is astounding, and yet our community needs are still immense,” said Ms. Costa. The Community Foundation is currently raising funds for its Community Fund, its single largest grant-making endowment. Donations may be made online at www.obcf.org/donate and are fully tax-deductible. Checks may also be mailed to 13 Skyline Road, Southern Shores, NC 27949.